True freshman wide receiver Tyjon Lindsey had himself a day at Nebraska’s practice at Memorial Stadium on Thursday. That’s according to reports — I wasn’t there — but it was all the reports. 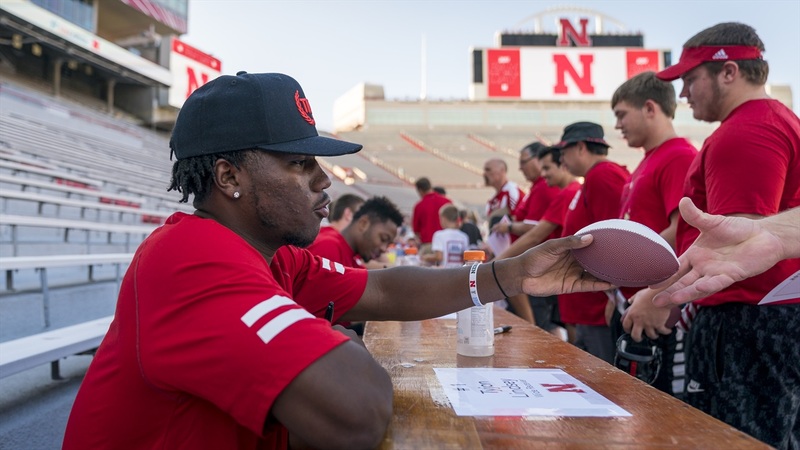 The Huskers held a practice and it turned into Tyjon-Con. And I’m not doubting the veracity of those reports in the least. If Jacob Padilla tells me something happened — like a juggling one-handed catch between two defenders — I believe it happened. It also just makes sense. Everyone expected big things from Lindsey and, so far, he looks like he’s going to be capable of big things right away. But how big is “big” for a true freshman wide receiver? If I had been present for Tyjon-Con, I probably would have delivered a presentation titled “A Brief History of True Freshman Wide Receiver Production at Nebraska Over the Past Decade.” (Catchy, right?) Since I wasn’t, I’ll share my notes here instead. Six Huskers have played wide receiver as true freshmen since 2007. That includes two players who have carved out nice NFL career for themselves and two players who are still on the team. Here are their stats in their debut seasons. Paul and Enunwa both missed portions of their freshmen seasons, so factor that in when looking at their numbers, but don’t throw them out completely. Paul still played seven games and Enunwa 10, so one catch for each deserves a somewhat skeptical eye when viewing the decision not to redshirt them. The other four, however, fall into what is a pretty solid “true-freshmen range” at Nebraska of about 21 catches for 287.8 yards (13.9 YPC) and two touchdowns. You taking over for Lindsey on any of those categories? I would, except for maybe YPC. That’s the most interesting number here to me. In theory, if you’re going to play a true freshmen at wide receiver, that player probably brings something a team doesn’t already have and often that can be “athleticism.” Pierson-El and Turner certainly fit that description. If a first-year player can make an offense more explosive by being on the field for even a limited number of snaps, he should probably play. Lindsey brings that, though I’m guessing Nebraska’s team YPC might go down in 2017 just based on the nature of the offense. But I think you can safely take “over” in all of the other categories (assuming no injuries) for a couple of reasons. One, Lindsey will have an advantage few others on the list had — a pure passing quarterback. Two, Nebraska needs some young receivers to step up. It might be the perfect blend of ability and opportunity. Hopefully we can revisit this topic and Tyjon-Con 2018. Nice Sam Foltz tribute immediately after scoring. ICYMI: Wide receivers prospects are visiting and decommiting, Mikale Wilbon has an opening at running back and there might be a potential tight endassaince. Matt Brown of Sports on Earth writes that Tanner Lee might face the most pressure of any transfer quarterback. P.J. Fleck has named two starting quarterbacks at Minnesota. Psst. The 2017 Hail Varsity schedule posters are available online.